My sweet adorable hubby got me an iPod Touch for my birthday. My FIRST iPod. I know what you are thinking. "This crazy lady is telling me to set up Google Reader to track my blogs but she didn't get an iPod until 6 months ago?" I've had various mp3 players, but this is the first real deal. And therefore, my first exposure to iTunes. And the world of podcasts. A few years ago a friend was talking about something she heard on NPR. I remember thinking she was crazy - who listens to news in their car? I was a snob. I listened to music only. You'd think my son's obsession with his crazy ABC Music & Me CDs would mean I was dying to listen to my music. But for some reason, I find I prefer to listen to people talking. NPR is fine, but my favorite podcasts are better! I have some favorites that I've become addicted to in the last 6 months. Some are crafty, some are parenting, some are just flat out random. But isn't that what my blog is all about? Hope you find something you like. Click the image to go to the iTunes site for that podcast. 1. 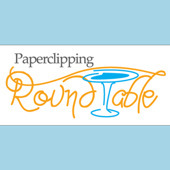 I've mentioned it before, but I LOVE Paperclipping Roundtable. It's a rotating panel that talks about scrapbooking concepts. They always do a "pick of the week" of a product or site that they love (and I've found some great ones from it!) and have an industry newsbit. Some of my favorite scrap-celebrities are on the rotating panel - Ali Edwards, Jessica Sprague, Stacy Julian, etc. 3. 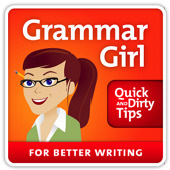 Grammar Girl rocks too! I know, you probably think I'm crazy. But I've learned the difference between farther and further, that Donald Trump doesn't know an action verb from a linking verb, and that using dashes (which I do far too often) is like yelling but parentheses is like an "aside". 4. Freakonomics Radio is so oddly entertaining. It's random information about topics you never knew you'd be interested in. 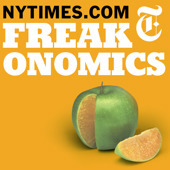 By the way, if you haven't read Freakonomics, I highly recommend it. 5. 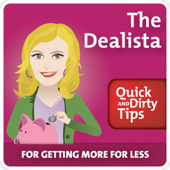 The Dealista is a great resource for saving money. Check out the old podcasts on couponing in Target and how to use Craigslist. The only thing I don't like about this podcast is that it doesn't get new shows very often. :( But at least there's a big list of past ones to catch up on! By the way, Paperclipping just started a new podcast that's purely digi! I haven't listened yet, but I'm downloading it to check it out. I can't wait! So glad you discovered the world of the iPod Podcasts. And I know you're talking about me.